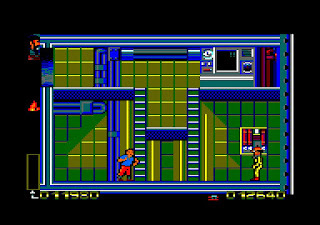 Tintin on the Moon is an action game that was also released on the Amstrad CPC (1989). Your mission is to launch a rocket from the Atomic Research Centre and land safely on the Moon. The first stage is the Journey Through Space where you dodge meterorites while collecting eight red spheres; yellow spheres can also be obtained to top-up your energy metre which acts as health. It reminds me of the opening stage in Zaxxon 3D (1988, Master System), as there's some excellent sprite scaling but tricky depth perception that causes issues with judging spatial distance. It's also absurdly easy as you have a healthy amount of energy and plenty of opportunities to grab red spheres. Once you've collected enough you move onto the timed In the Rocket stage; here you navigate various rooms to disarm bombs, collect extinguishers to put out fires, free your companions and capture the evil Colonel Boris. If Boris shoots you you'll be temporarily stunned while he starts more fires. What's most interesting is that you can switch gravity with the B button which is great for reaching extinguishers and quickly avoiding attacks! It's fun multitasking and this could easily be a full game in its own right if there was more variance in the level design. After successfully completing both stages five times you take part in the final Moon Landing sequence. This involves regulating the auxiliary engine by braking for a smooth landing; your remaining energy is then added to your final score. It's somewhat reminiscent of Lunar Lander (1979, Arcades) but you have barely any input here, and the fact that you have no directional movement makes it stupidly simple to focus on small thrusts for a smooth landing. 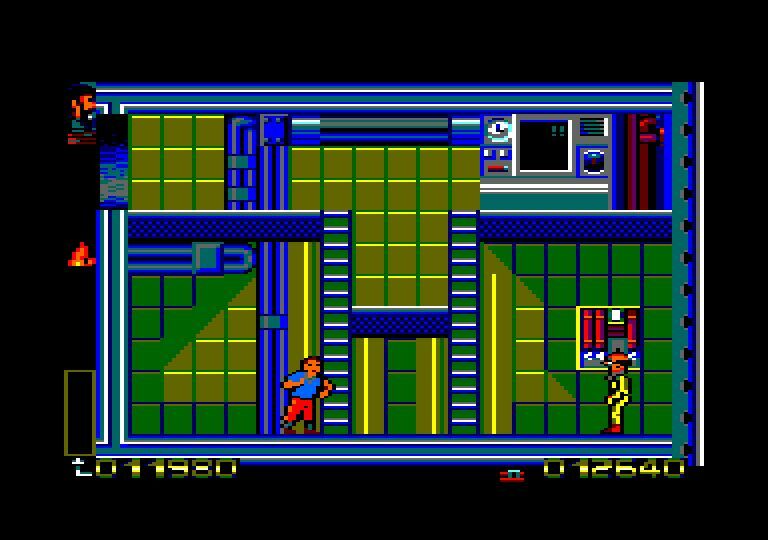 Overall, the game is far too easy and does nothing to improve on the Amstrad CPC original. Tintin on the Moon has some great ideas and while it's clearly aimed at kids there's a real charm to its simplicity and multiple gameplay styles. However, the lack of content and challenge is disappointing, and I'm surprised the developers didn't expand on their innovative core ideas, or at least add difficulty settings to satisfy all skill levels. Random trivia: 16-bit computer ports were also released on the Amiga (1989) and Atari ST (1989).